Faraway Press: The Online Home of John Jackson Miller: Knight Errant #4 hits the stands -- with bonus novel preview! Knight Errant #4 hits the stands -- with bonus novel preview! Just two weeks from the release of the Star Wars: Knight Errant novel, we've got some more Sith War goodness coming at you. 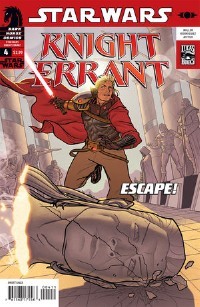 Star Wars: Knight Errant #4 goes on sale on Wednesday! This is the one you've been waiting for. Kerra Holt, dashing frenetically back and forth between Lord Odion and Lord Daiman, finally hits the end of the line. Will she find her true mission? What will be the fate of Gorlan Palladane -- and the people of Chelloa? This issue also includes a preview of the Knight Errant novel -- one that we haven't seen in #0 or Star Wars: Red Harvest . It falls between the two (but there are still parts in there you don't have yet). I'll have some notes on the issue up shortly. Enjoy!